Those of you who are hangar or tie down tenants likely received a letter from DOT-A announcing new rent increases. These revised increases represent the outcome of meetings between GACH leadership and the DOT-A property management people, including the appraisers working for the state. The originally proposed increases were substantial, the revised increases generally much less so. 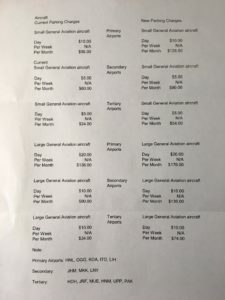 An important thing to note not explicitly stated but confirmed by GACH with DOT-A is that the rate quoted in your increase letter represents the amount DOT-A expects you to pay each month. 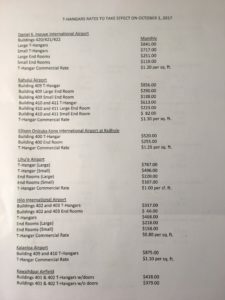 There is no longer an additional “electricity surcharge” in addition to the rental amount stated. 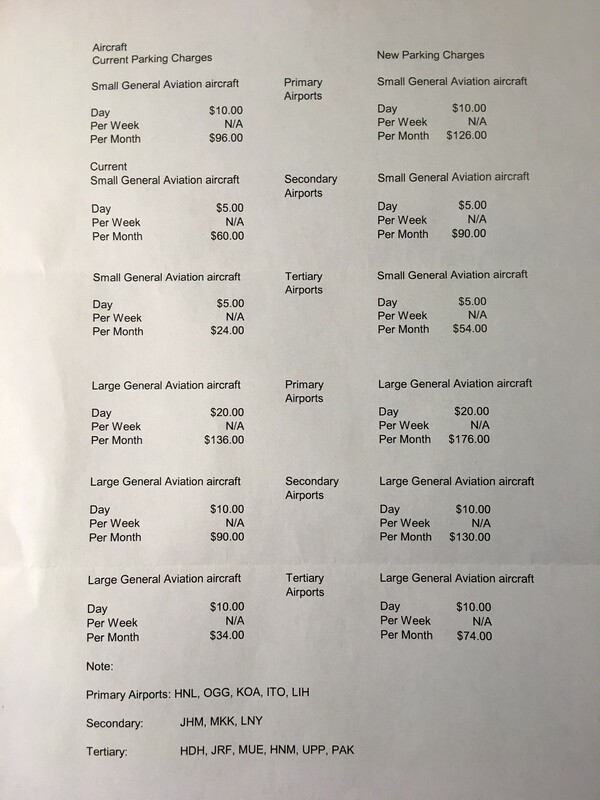 For example, the rate for a small hangar at HNL was previously $674/month, plus a $55/month electricity surcharge, for a total of $729/month. The new rate as of October 1st, 2017 is $772/month, so that’s an increase of $43/month, or just under 6%. Tie downs at the major airports have increased ~$1/day, which is still a substantial percentage. 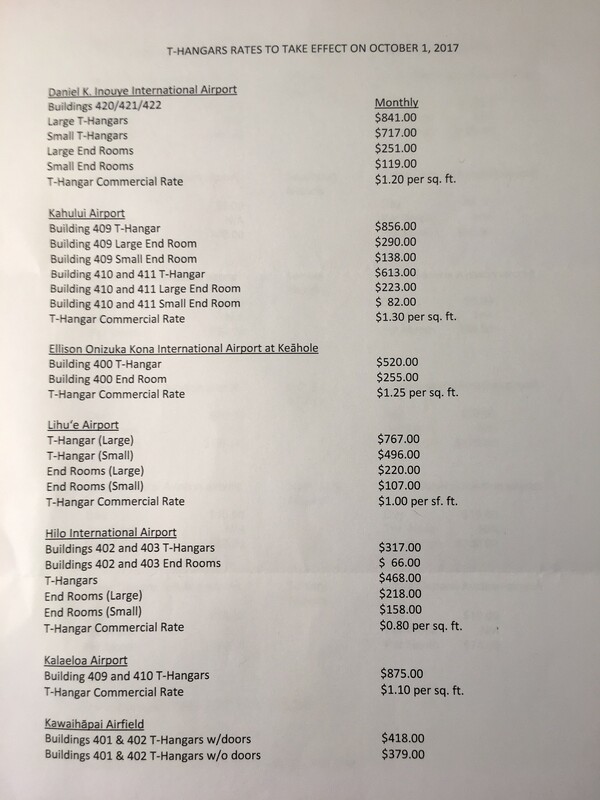 You’ll find the complete list of rates for all Hawaii airports attached below. 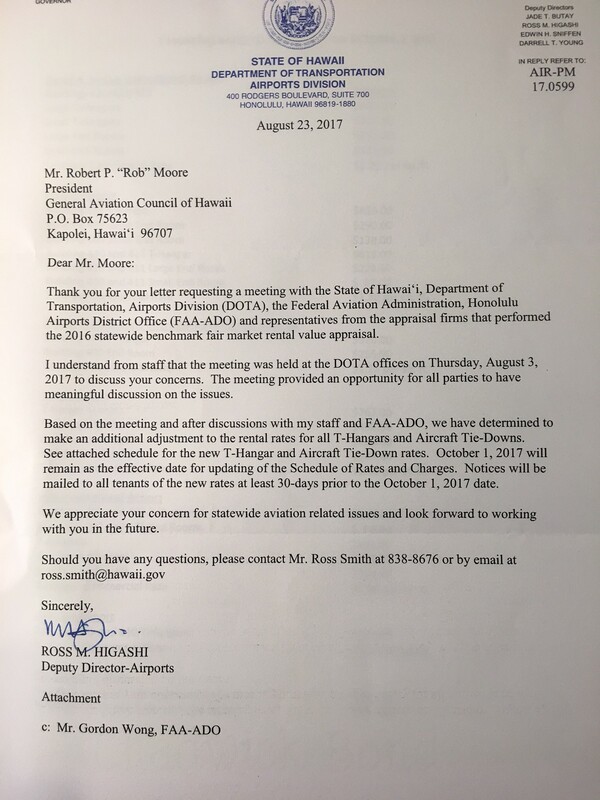 GACH will continue to work with DOT-A, the FAA, and AOPA to address the ongoing issues around hangar and tie down rates at all Hawaii airports, including the process by which rates are set and periodically reviewed. We would like to see DOT-A comply with federal guidelines on setting rates and negotiating leases, as well as agreeing to adopt FAA guidance on the contents of hangars. We’ll also continue to work towards decriminalization of violations on the airport in the upcoming legislative session. 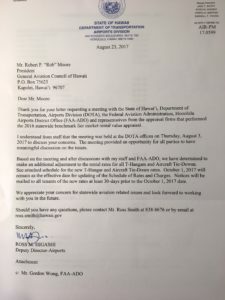 There will be a meeting at Island Seaplane Services for Airport RP holders that pay rent on a square footage basis and who suffered a significant rate increase from State DOTA. The meeting is Thursday, September 7, at 5PM (1700). Please bring your old invoice (showing current rate) and the DOTA notice that increased your rate effective October 1, 2017. At least in my case the increase is way higher than published on the list of rent attached above. Right now I pay $50 per month for the tie down at KOA. New monthly rental will be $126.00 plus annual fee of $200.00 for property tax. how can they charge us property tax on the tie down spot if you lease / rent it ? isn’t that double jeopardy ?